Construction of a lift shaft in my neighbourhood for corridors not served directly by lifts stopping at every floor. 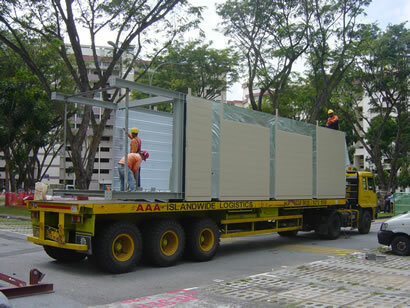 Hoisted into place by 2 cranes. An extra heavy duty vehicle crane will extend its arm & another vehicle crane will help contruct the horizontal crane(which is transported via long long vehicle). Lift shaft cubes which will be hoisted up & over to the front of the building. 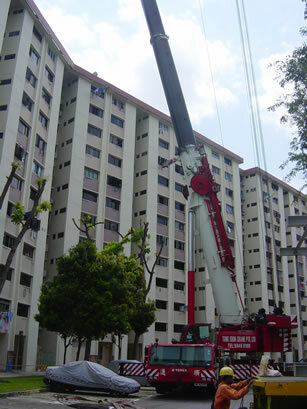 Relying on the arm extension is not enough to reach other side of building hence the need for horizonal crane extension. Shell of the shaft is metal plating. 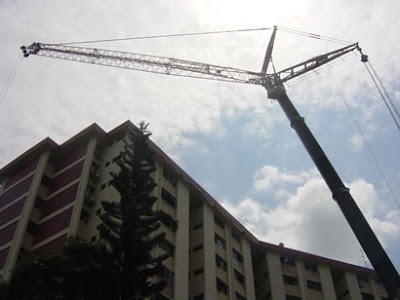 Light & easier to lift up for faster construction. Once completed & painted with the building's color, most won't know that is mainly metal shell plating & not concrete/bricks(ground floor).